Yesterday during a session at the Texas Birth Network “Birth Roundup” registered nurse Tasha Portley asked Ina May Gaskin about the impact of racism on the births of Black women. https://www.facebook.com/tasha.portley/posts/1448318131887173?pnref=story. Gaskin responded with anecdotal stories about Black women who lost their lives as a result of provider negligence, and blamed the Black women for not being more informed of their life-threatening symptoms. Moreover, Gaskin stated that “drug overdose” and the use of illegal drugs was the cause of the massive amount of Black maternal death rates. She also mentioned that communities “don’t pray as much as we used to” as a reason contributing to maternal death rates. Black women die at a higher rate than any other group of women from preventable birth complications. Black women continue to be refused quality and safe care due to educators and leaders like Ina May Gaskin. Ina May Gaskin represent the ways in which white supremacy and anti-Black racism continues to harm the safety and wellbeing of Black women who are in need of quality maternal healthcare. 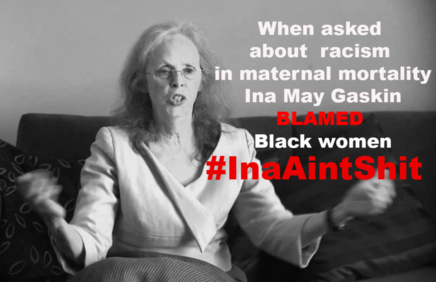 The white supremacist and anti-Black narrative perpetuated by Ina May Gaskin and those who ascribe to her teachings are the very narratives that LITERALLY cost Black women their safety and lives.